Just wanted to put out a quick post to let you know I recently was a guest on the Your WoW Money Podcast, if you want to check out the episode, you can do so at this link! Hope you all enjoy, it was fun to get back into podcasting. Exciting news today. I finally put together a plan I have had in mind for a long while, to create a spot on my blog to feature gold making related hate mail. I've been the recipient of quite a few crass hate mails over the years, and I've saved some of the more touching ones in my bank alt's guild bank. That being said, once a week (or perhaps once every 2 weeks depending on submissions), I'm going to be featuring hate mail sent to me, sometimes along with a back story (if one is included). If you're interested in sending in your own hate mail, please use this template form with instructions to do so. Without further ado, below is some of my own hate mail that I've received over the years to kick it off. Not much backstory on these, just people raging at my AH Alt that I use to post transmog (dat beautiful orc above). I keep these saved in my Alt's guild bank to look back on for inspiration. Hate mail is going to be compiled on this page (in toolbar above), with links back to the original posts, if you want to read more on the backstory. As this is a new project for me, please leave any feedback you have for the process in the comments below, or via social media. Recently I added a vendor subgroup to my TSM Transmog List, because there were quite a few items on my transmog list that happened to be vendor items, that people were unaware of based off my list alone. As I was shopping later that week, I came across an item, Glorious Shoulders for 600g. At first I clearly recognized this item as the shoulders for Glorious Transmog Set, a very sought after "platekini" set for transmog. Seeing it for 600g I thought, what a deal! These pieces sell in the 10's of thousands, and these shoulders were only 600g! Of course, I moused over the item to see it's DB Global Market value before purchasing, and I noticed something odd. The market value was 5k and it was in my Vendor group. Of course my first thought was "you can buy pieces from the Glorious set from a vendor!?" 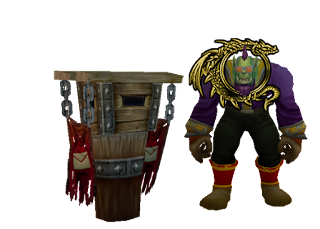 I took to Wowhead, and if you were sleuthy enough to click my Glorious Shoulders link above, you'd know that the linked shoulders are nothing but! Nothing Glorious about these Shoulders...except maybe the name! As many of you may have noticed, TSM_Wowuction has been a bit unstable recently, with price updates taking much longer than normal. To this effect, the TSM team has announced they've decided to end support for Wowuction pricing as of the r303 release of the TSM App. Most likely, not much. As mentioned in the above post, the Wowuction price sources will now map to a corresponding TSM price source. Also, TSM has created their own Region Market price source in DBRegionMarketAvg. Quite frankly, I was unaware that DBGlobalMarketAvg was truly "global" (US and EU servers combined), and I had thought that it was a Region-wide (US or EU specific )price source all along. The difference now would be that you should be able to recognize nuances in the price sources between US and EU servers now, which is most likely quite noticeable in high end items. To me, this update is a bit of a nonissue. I've stated multiple times that I much prefer TSM sources, as they are updated hourly to my addon, and the TSM team is much more involved in World of Warcraft, and have been consistently there to fix things when they go awry, whether it be a battle.net Auction House API update, or changes in game that require the addon to be fixed. They are the gold standard for the WoW gold making community, and I believe they will remain so for time to come. I believe that to an extent this will also clear up some confusion for newbies when considering price sources for items, as now there is not as much confusion between the sources and they're all fairly well described. If these changes go live before the weekend, I'm going to attempt to put together a video on price sources over this weekend, as quite frankly it will be a lot more straightforward now.